SOLIDWORKS FloXpress is fluid flow simulation software included with SOLIDWORKS. SOLIDWORKS FloXpress is a fluid dynamics add-in application included with SOLIDWORKS, that calculates how fluid flows through assembly models. Based on the calculated velocity field, you can find problem areas in your design and improve them before you manufacture any parts. 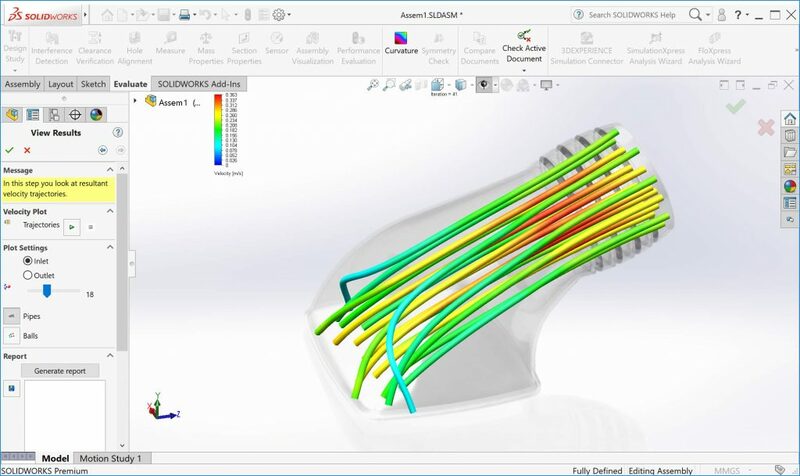 Unlike the full version, SOLIDWORKS Flow Simulation, SOLIDWORKS FloXpress is specifically designed to analyze fluid flow in a fully enclosed volume that includes at least one inlet and one outlet. For more complex fluid analysis upgrade to SOLIDWORKS Flow Simulation. Complete Integration with SOLIDWORKS. SOLIDWORKS FloXpress is fully embedded within the SOLIDWORKS Windows®-native environment. There is no need to modify your SOLIDWORKS designs for fluid flow analysis. Wizard mode for analysis setup. SOLIDWORKS FloXpress uses a wizard interface to setup the analysis thereby making it easy and intuitive to solve the problem. Engineering goal based analysis. SOLIDWORKS Flow Simulation is a goal based CFD analysis program. You simply tell the program what fluid analysis you are interested in and it will calculate these goals and present to the user after the completion of the analysis. This functionality helps you to get better engineering insight into your designs. Flow Animation with SOLIDWORKS FloXpress uses Trajectories to display results as flow streamlines. The colors represent changes in velocity along the trajectories. Based on your input, the color of the trajectories shows how any parameter changes along the trajectories. The SOLIDWORKS FloXpress Add-in is part of the SOLIDWORKS Premium software bundle from Javelin. SOLIDWORKS Premium software gives you powerful, easy-to-use functionality that automates tasks, streamlines workflows, and helps you quickly define and validate the form, fit, and function of your design. Part of the SOLIDWORKS product development solution. Includes tools for design, simulation, sustainability, communication and data management—SOLIDWORKS Premium empowers innovative design with specific tools that help you work more efficiently so you can make better design decisions. Interested in the SOLIDWORKS FloXpress Add-in?